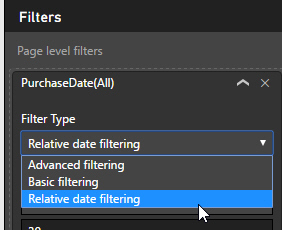 You can now use relative date filtering in slicers and filters. 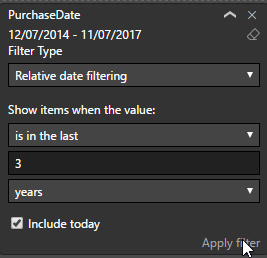 Choose this option when applying a filter to enable relative date filtering. 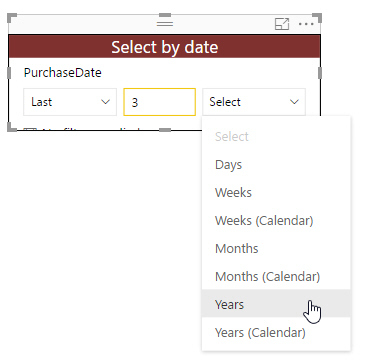 You can show values which are in the last, next or current day, month or year. You can type in the number of time periods to go forward or back. I normally turn this off and use a slicer title instead, but you can't do this if you want to use relative date filtering. 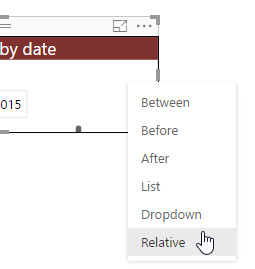 You can click on this arrow in the slicer header to choose a different way to filter the data. 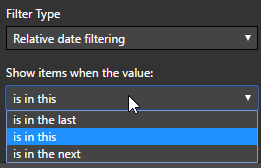 Choose this option to use relative date filtering. Here we're showing data for the last 3 years, but lots of other combinations are possible! Relative date filters in slicers were introduced as a preview feature in May 2017 - I'm not quite sure when they slipped into live mode.